It has been a while, since I introduced Yantai (Shandong), China’s food industry capital. Somewhat later, I added a blog about the specialised food capitals. That list included Zhangzhou in Fujian province, as China’s canned food capital. However, the Zhangzhou food industry has developed so rapidly and broadly during the past few decades, that it should be regarded as China’s second food industry capital. In fact, the city already earned the title of “China’s famous food centre” from the China National Food Industry Association in 2011. Determined to become a prestigious food production centre, Zhangzhou in Fujian Province is well-equipped to strengthen and enhance the structure and standards of its food industry. Zhangzhou continues its efforts to stimulate innovation and development in the food industry. The city’s ultimate aims are to establish a qualified and systematic food manufacturing centre with high standards and to strengthen its food-brand influence in the industry. In 2013, there were 425 large-scale food manufacturing enterprises in Zhangzhou, accounting for 26.4% of the total numbers of significant enterprises from all industries. Food production values amounted to USD 12.08 bln, up 20.9% from the previous year. Exports of food and subsidiary agricultural products from Zhangzhou totalled USD 4.1 bln, up 47% and were responsible for 66% of Fujian Province’s total exports. There are three main streams of revenue for Zhangzhou’s food industry, namely subsidiary agricultural food processing, food and wine manufacturing and beverage and tea production. Seafood, vegetables, oil and fertilizers are the main categories on the subsidiary agricultural food processing list, which generated a total production value of USD 7.8 bln in 2013 – an increase of 30%. The total production value of food manufacturing, mainly canned food and biscuits, amounted to USD 3.3 bln, up 31.3%. The total beverage and tea production, with Oolong Tea and other beverages as best-sellers, had a value of USD 574.5 mln, an increase of 27.4%. After years of development, Zhangzhou has established a firm foothold in the business of producing speciality food, such as canned fruits and vegetables, frozen vegetables and seafood and the processing of meat and preserved fruits. Of equal importance are food and food-related items such as biscuits, vegetable oil, fertilizers and tea. Zhangzhou’s production of canned food occupies 60% of the province’s total and 11% of the nation’s total. In particular, exports of canned mushrooms represent more than 80% of China’s total. Zhangzhou also plays a significant role in many other categories. For example, it is the number one producer of canned asparagus, water chestnuts and bamboo shoots; the key production base of candied ginger, providing 80% of the European market’s supply; and the second largest exporter of processed seafood in the province. Among the city’s large-scale food enterprises, there are 190 (11.3% of the total) with the capacity to produce more than USD 16.1 mln worth of food. Zhangzhou’s high production capability is further proven by some impressive figures in 2012, which recorded 12 companies capable of producing more than USD 161 mln worth of food (6.3% of the total); 85 companies with a total production value of USD 32 – 161 mln (44.7%); and 48.9% of the total that could produce food with a value of USD 16 – 32 mln. Prominent subsidiary agricultural food companies are Hongyi Grain and Oil Resources Co Ltd, Fujian Haikui Aquatic Products Group, Dabeinong Group, Fujian Dongya Aquatic Products Co Ltd and Fujian South China Sea Food Ltd.
Major food manufacturing enterprises include Fujian Zishan Group Co Ltd, China Lubao Group and Danco Group; while beverage and tea producers comprise Damin Foodstuff (Zhangzhou) Co. Ltd, Taisun Enterprise (Zhangzhou) Food Co Ltd and Tsingtao Brewery. There are two publicly listed food companies, namely the Fujian Haikui Aquatic Products Group and Tenfu Corporation. There are 34 foreign-investment enterprises with total business values of USD 1.1 bln, representing 8% and 9.7% of the total of overseas enterprises and their value. Sixty-two companies are run by entrepreneurs from Hong Kong, Macau and Taiwan with values of USD 2.6bn, and 329 domestic companies have a total business value of USD 8.2bn. A dramatic increase in the number of food brands can be seen in Zhangzhou, a result of the city’s great enthusiasm for product innovation and the city government’s aggressive brand name strategy. By the end of 2013, there were 292 brands awarded “provincial-level status”. Among these, 25 are famous food names in China, one being “national-level status” and 266 are classified as the province’s “prestigious brands and products”. In 2013, seven new brands reached “national-level” and 26 new labels were awarded “provincial-level status”. Zhangzhou’s ultimate aims are to establish a qualified and systematic food manufacturing centre with high standards and to strengthen its food-brand influence in the industry. Zhangzhou is a renowned coastal city in Fujian Province with a surrounding sea area of 18,600 square kilometres and 112,300 hectares of shoal area. 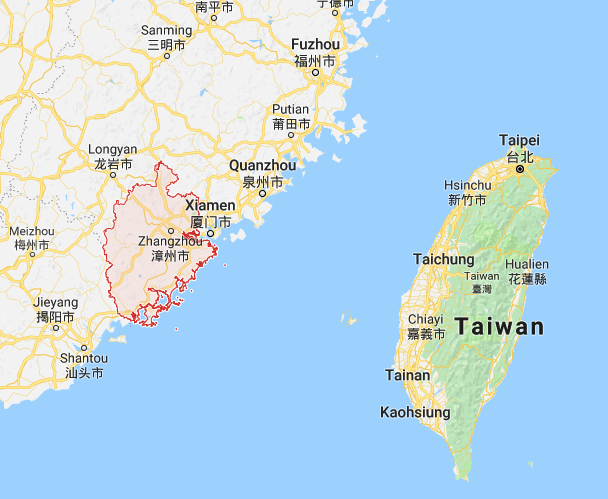 The 715-kilometre-long coastline starts in the north at the Jiulong River Estuary and continues down to the south to the Tielu Gang of Zhao’an County in Guangdong Province, featuring a coastal tortuous rate of 1:4.12. There are more than 20 natural harbours in the city, such as Xiamen Bay, Futan Bay, Jiuzhen Bay, Dongshan Bay and the Zhaoan Bayand Gongkou Gang. The city also has 232 islands with a 2,098-kilometre-long island shoreline, plus 36,000 hectares of usable sea area. All of these favourable coastal landscapes have enabled Zhangzhou’s fishery industry to develop into a fully-fledged sector, producing 1.54 mln mt of seafood worth USD 2.9 bln, representing an economic value of USD 6 bln. There are more than 300 companies involved in seafood processing — producing 723,000 mt of products (25% of the province’s total), worth more than USD 2.5 bln. Zhangzhou also exports 383,700 mt of seafood with a total value of USD 2.62 bln, registering an increase of 33.13% and 39.5% respectively. There are five enterprises that can produce seafood worth more than USD 161 mln, and 34 companies with a value of more than USD 16 mln. The city produces five of China’s most famous brands in addition to seven “provincial level labels” and 24 “prestigious” products. The area has recently accelerated its pace of becoming a key producer of grouper fish. It is determined to accomplish the goal of being the “capital of grouper” and set a record for producing 15,000 mt of grouper, worth USD 241 mln, by 2015. The goal can only be achieved by means of continuously nurturing juvenile grouper, in addition to developing a healthy and standardised rearing system plus a commercialised strategy for fish farms. For many years, Zhangzhou’s seafood has been exported to the US, Japan, Korea and Southeast Asia. Export markets are now expanding to countries and regions such as the EU, Russia and South America. In 2011, the city’s seafood products were exported to almost 80 countries and regions, with more than USD 100 mln worth of produce for sale to Taiwan, the US, Vietnam and Hong Kong. Presently, Zhangzhou, compared with other cities in the province, has gained the largest number of registered import permits to various countries and regions across the globe. For example, 45 companies are registered to be allowed to import seafood to Indonesia, 35 to Vietnam, 35 to Korea, 25 to the US, 11 to Russia and seven to the EU. There are 97 large companies with annual production values of more than USD 805,000, and 21 of more than USD 16.1 mln. The number of export companies is increasing. There are 29 companies that export products worth more than USD 10 mln and seven companies at more than USD 50 mln. Among all, Fujian Dongshan Haikui Aquatic Products Group Co Ltd exports seafood products worth USD 200m, one of the top 10 companies in the city. Above all, there are 13 standardised fish farms in the city, three healthy breeding model farms, 20 non-hazardous production bases and 59 export centres. A number of sub-regions of the Zhangzhou Municipal Area have taken up the food image of Zhangzhou in their own regional marketing. Within the larger Zhangzhou area there is a city called Longhai. While for Zhangzhou the food industry is regarded as a pillar of the regional economy, for Longhai it is the nr.1 industrial sector. The Municipality of Longhai has started profiling itself nationally as the ‘capital of leisure food‘ in 2019. The region is home for 605 food companies certified by the State Food and Drug Agency, covering a broad range of products. The Longhai government claims that about one third of the Zhangzhou food industry is concentrate in their region. Longhai is closer to the sea than the Zhangzhou municipal area. Zhangzhou’s Zhao’an County has been famous since ancient times as a production region of green plums. The region produces 105,000 mt p.a. of these fruits. The local government decided in 2017 to actively support the growing of plums for 5 years, investing RMB 15 mln each year. Plum exports generated over USD 50 mln in 2018. Plums are not only sold as primary produce, but also processed into various products. 38 of the major plum growing and processing companies of Zhao’an organised themselves into a Zhao’an Green Plum Industry Promotion Association in March 2019.